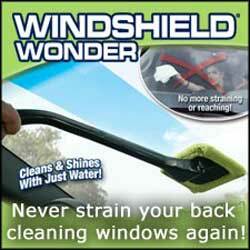 The Windshield Wonder uses a 16" handle to help reach all the way down to the dash and base of your rear window. Micro fiber cloth is uniquely suited for cleaning windows with fibers that open up to grab particles of dirt and dust and then hang onto them. I liked the idea of an easy way of cleaning the car windows and believe it or not, it does work great and is very easy without all those chemical cleaners plus not being able to reach in the far corners of the windshield. It is a great thing.